Rabindranath Tagore – Poet and Dramatist is the biography of Rabindranath Tagore (7 May 1861 – 7 August 1941) by Edward Thompson. 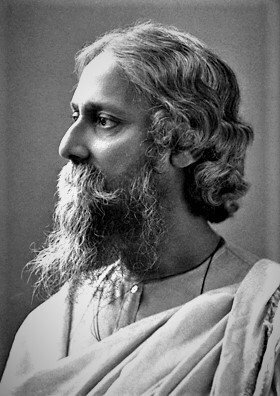 Rabindranath Tagore received the Nobel Price in literature in 1913, as the first Asian to receive the price, and second after Roosevelt outside Europe. He was awarded for his numerous poems, inspired by medieval Indian literature and ancient Hindu spiritual verses, the atavistic mysticism of Vyasa among others. Rabindranath Tagore is most known for his poetic work Gitanjali – Song Offering, but he also wrote thousands of songs, short stories and he drew hundreds of paintings among other artistic expressions. His rise to fame in India and abroad let him meet with the most influential individuals of the time, among them Albert Einstein and he became a close friend of Mahatma Gandhi, with who he shared political views on the British supremacy and Indian nationalism. Rabindranath Tagore’s original gold Nobel Prize from 1913 was stolen from a safety vault from the Visva-Bharati University in March 2004. – Fun fact: did you know, the next Indian Nobel Prize winner from 1914, Kailash Satyarthi, had his statue stolen in 2017? Rabindranath Tagore – Poet and Dramatist is the biography of the Nobel Prize-winning Indian poet Rabindranath Tagore (7 May 1861 – 7 August 1941) by Edward Thompson. This documentary was made to celebrate Tagore’s birth centenary in May 1961.